Stuart Broad says England must stop losing early wickets if they are to defend their World Twenty20 crown. 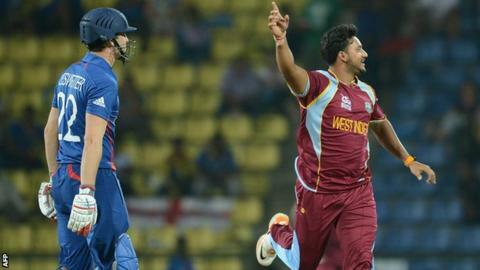 England fell 15 runs short in their Super Eights opener against West Indies, despite Eoin Morgan's scintillating 71 from 36 balls. Craig Kieswetter and Luke Wright were dismissed in the opening over as England's pursuit of 180 started badly. "It's disappointing to lose early wickets," said Broad. "It's hurt us twice now and we need to stop it." "England were very scrappy throughout but they didn't lose massively so can still pull it back in the next two games. They look like they're lacking a player or two; a hitter and maybe another bowler, though Stuart Broad did very well." England found themselves 0-2 after three balls of their reply, just three days after sliding to 18-2 before being bowled out for 80 in their final group game against India, which they lost by 90 runs. Both Kieswetter and Wright were responsible for their own downfall against Ravi Rampaul and left their team with too much to do after Alex Hales had led the fightback with 68 alongside Morgan. "Our principle is that we allow ourselves time to have a look for a couple of overs, assess the wicket and then take our strong options and utilise our strengths," said Broad. "We lost two soft wickets early on today and it didn't help us. "It showed what an awesome batting wicket that was, to get as close as we did having to regroup as much as we had to. "There are a lot of positives to take out of it from the bowling side of things - the way we regrouped after they got off to a good start and keep them to a total which I thought was below par." Openers Chris Gayle (58 off 35 balls) and 23-year-old Johnson Charles (84 off 56) starred for the Windies, before Morgan took over and almost saw his side home. "Morgs played fantastically well," said Broad. "That's the skill of the man - he finds the boundary when the fielders are on the fence. "[But] I feel deflated because I thought the total was chaseable and we didn't get it quite right." England have two matches left in the Super Eights, against New Zealand (Saturday) and Sri Lanka (Monday). "It's a must-win against New Zealand - we have to win both of our matches now," added Broad.